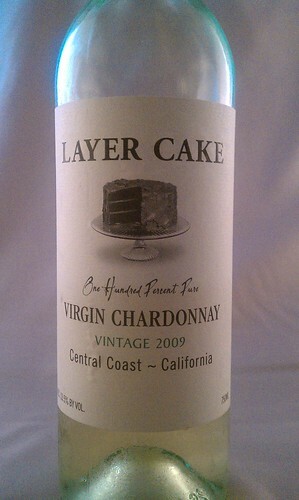 The name Layer Cake supposedly comes from Woodbridge’s “grandfather’s comparison of vineyard soil to a layer cake”. I don’t doubt it, however Woodbridge is looking to give international appeal to his wines or brands, and who doesn’t think a wine called "Layer Cake" could possibly be quite delicious!?!? In other words, I propose that the name “Layer Cake” is more marketing that it is nostalgia (but who really cares?). Layer Cake produces 5 wines from 5 different countries, an Italian Primitivo (Zinfandel), Argentinean Malbec, Australian Shiraz, Napa Cabernet and their Virgin Chardonnay. They used to make a Cotes du Rhone, but recently stopped production. The grapes are all sourced from different vineyards in and around each region. In other words, they don’t grow any of their own grapes used to make the wine. This is normally used to keep a winery operation more economical, but some argue that quality can sometimes suffer if meticulous grape selection is not used. Central Coast vineyards benefit from the cooling effects of winds and fog that come through the Monterey Bay each afternoon. This preserves crisp acidity and aromatics in the grapes. The Central Coast is comprised of the counties of Alameda (Livermore Valley), Contra Costa, Monterey, Santa Barbara (Santa Ynez Valley), San Benito, San Francisco, San Luis Obispo (Paso Robles), San Mateo, Santa Clara and Santa Cruz (Santa Cruz Mountains). Winemaking in the Central Coast dates back more than 200 years, when the very first vines were planted by Franciscan monks in Monterey County and Santa Barbara, although they primarily used their wines for sacramental purposes. A lot of the land between L.A. and San Francisco is actually former ocean floor and made up of sand and limestone. This gives good drainage and low nutrition to vines which aids root development, limits vine growth (which is a good thing) and therefore a low water-to-sugar ratio which concentrates flavors. I checked out the Layer Cake website and word-for-word, this is one of their tasting notes: “…a hint of lemon meringue pie baking inside the cottage nearby…”. I wish I was that poetic! This is a very well made Chard for the money, I just wish I had discovered it earlier in the warmer months! The usual suspects: chicken, cheese, fish. Also give thought to spicy dishes, lobster in a buttery sauce, shellfish, pork and turkey, or just drink by itself on a hot autumn day (if that makes any sense to the people reading this that live outside of Florida).